The following covers the process of adding stats users, adding and editing stats, and accessing a domain stats URL. How do I get stats for my website? Website owners often like to know how much traffic their site is getting at any given time. 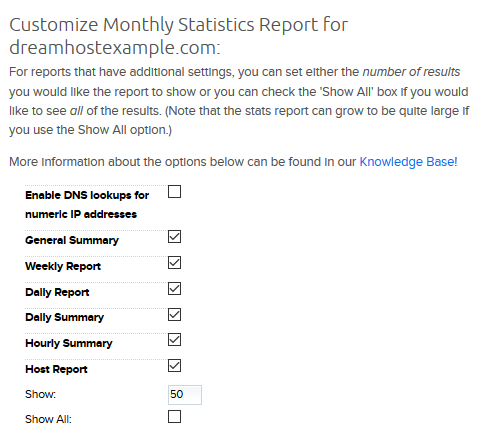 DreamHost offers a way to set up site stats for a domain on the Site Statistics page. 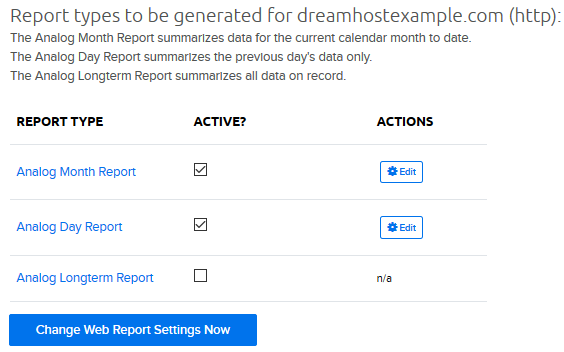 From the Site Statistics page, you can add a Stats User, activate statistics for a domain, and configure statistics reports. Site statistics begin to record only after you create a user. You cannot obtain any site statistics before then. Adding a Stats User is also useful for protecting domain stats and providing access to another person. Go to Site Statistics page. Click the ‘Add one?’ link under the ‘Stats users’ column. Create a Username and Password. This user may only be used to access your stats and cannot be used for anything else in the panel. If you would like to add an additional Stats User, you can do so by clicking on the Add Stats User button to the right of your chosen domain. Visit the Site Statistics page. Click the Configure button to the right of the domain. Check the ‘Active?’ box for any you’d like to begin tracking. Click the Change Web Report Settings Now button to save your changes. Go to the Site Statistics page. On the next page, click the Edit button to the right of either the ‘Month’, ‘Day’, or ‘Longterm’ report. Once you’ve customized your stats report, click the Save Changes button to save your new settings. Once stats are active for a domain, you can access them by loading the /stats subdirectory in your browser. For example, if you just enabled stats on the domain example.com, you’d then visit example.com/stats. A login prompt appears after you enter example.com/stats. If you’re using a CMS such as WordPress, you may need to add additional code to your site's .htaccess file in order to access the /stats login page. View the Making stats accessible with htaccess article for further instructions. Article last updated April 09, 2019 19:24 PST.